1) In a mixing bowl, add flour, cocoa powder, coconut, baking powder, salt, and sugar. 2) In a separate bowl, add the milk and oil together. Then add liquid ingredients to the dry ingredients. Use a whisk until there are no lumps. 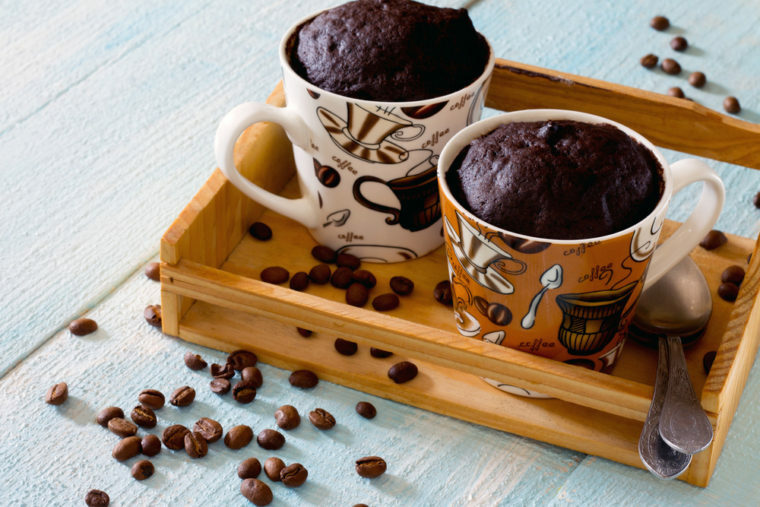 3) Add batter to microwave-safe coffee cups. Fill ¾ of the way to the top. Add 1 tbsp of chocolate chips and 1 tbsp espresso or coffee beans to each coffee cup and stir in. 4) Place one coffee cup at a time into the microwave and cook on high for 1 minute and 20 seconds. 5) Dip a knife or spoon into the center of the cup to make sure the batter is cooked through. If part of the cake is still uncooked, add cook time, 20 seconds at a time, until cooked through. 6) Serve with a scoop of vanilla ice cream or whipped cream if desired.